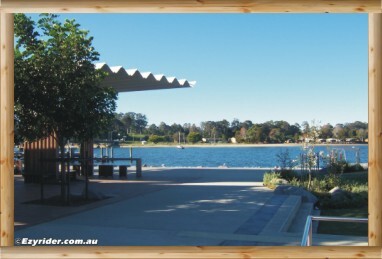 Batemans Bay Centre Park is centrally located for all amenties and services. Just across the road from a variety of eating and dining services, with a shopping centre and with a view thrown in for extra relaxation. 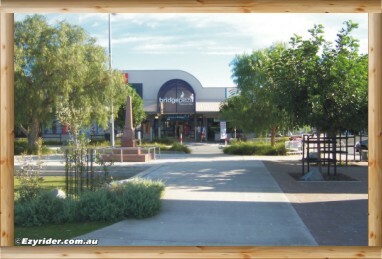 Parking can sometimes be difficult next to the park, however, there is also parking at Lyons Park and underground parking at the main shopping centre. If you are looking for fresh fish to buy for cooking, there is a fresh fish shop inside the shopping centre stocking local and Australian fish. 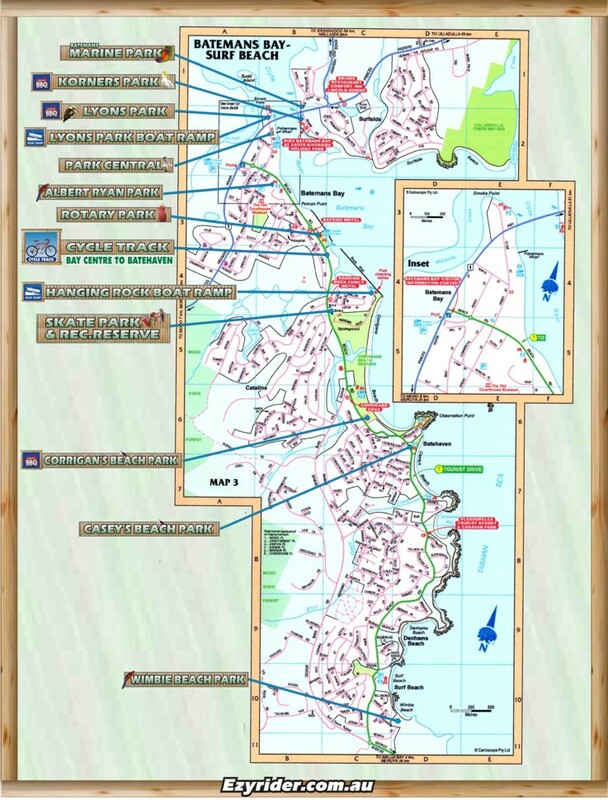 A map of parks in Batemans Bay is located at the bottom of this page. 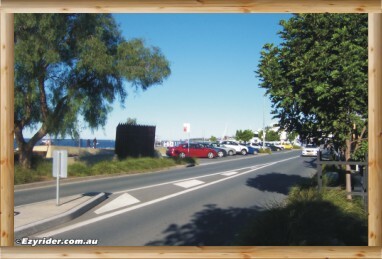 Looking east towards the centre of town along the foreshore. 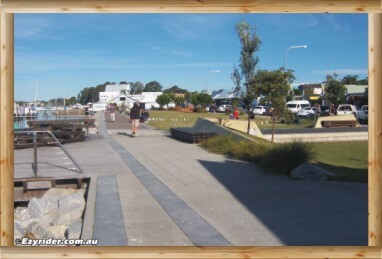 There is a small park in the foreground and then the larger park area (with the seagulls) in the background. All the shops are to the right, with parking. Taking a step back with the camera shows the covered seating. 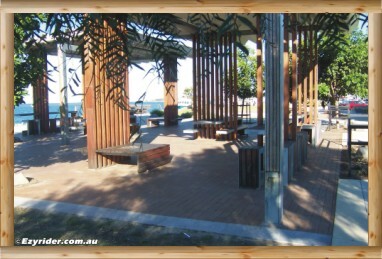 Notice on the left of the footpath is a viewing platform over the water. There is also seating on the platform. 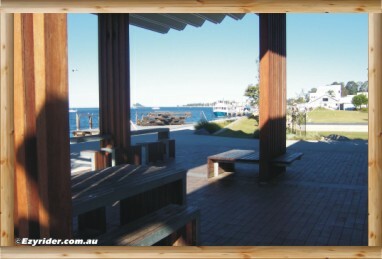 Inside the seating area, looking east towards the park and ocean where in the background are day cruise vessels and a fish and chip shop. Taking a step back with the camera shows the under cover seating area in more detail. Looking out northward, towards Wharf Rd. Park and beach in front. 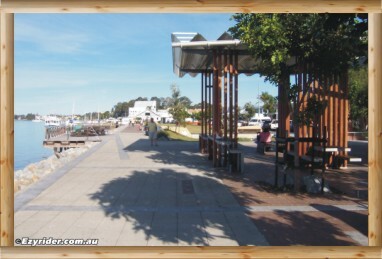 This jetty is located towards the left of seating as shown in the left hand photo. 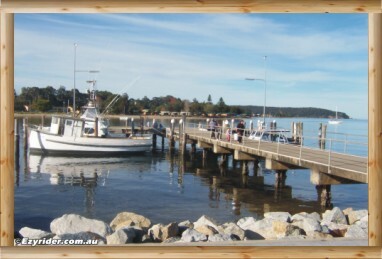 You are able to fish off this jetty. Looking towards the park from over the road, shows the angle parking at the front. To the right is the undercover seating with the cenotaph just to the left and in the background is the shopping centre entrance. 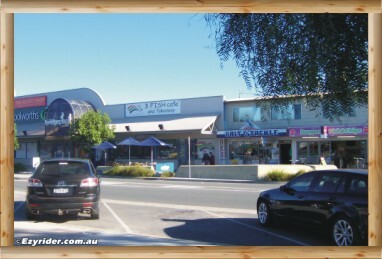 To the right of the shopping centre entrance is an outdoor and indoor fish and chip (and more) shop, with bait and tackle on its right. Outdoor & indoor seating with a view. 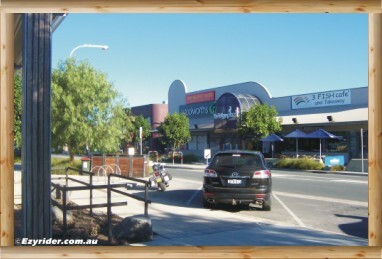 Looking further down is the shopping centre entrance again, and on its left an indoor and outdoor seating restaurant. Ideal for taking in the view towards the water.